Finding way to combat fats and burning body fats effectively ? Well, here's something I tried out which would work out for you ! Not to forget, you can't think of loosing weight without exercising or eating a healthy clean diet ! I am difinitely one of those not with high metabolism rate and I totally admit if I eat too much , I would be fat like a panda. The one body part of mine which would get fat easily are my thighs and legs. The solution ? I would need to burn more fats targeting my thighs , legs and tummy. you are definitely missing out ! it also contricts my waist ! The Jonliva Activ Pants does makes me sweat more inside. you can choose a preferable size that you feel comfortable with. So , why have I chosen Jonlivia Hotpants instead of other brands ? We all know that Hotpants is not a cheap pants and there are definitely other brands out there in the market . Jonlivia Active Hotpants is Genuine Neoprene Made and have 4 layers. Their fabric technology is way much thicker than other brands I have seen in the market. 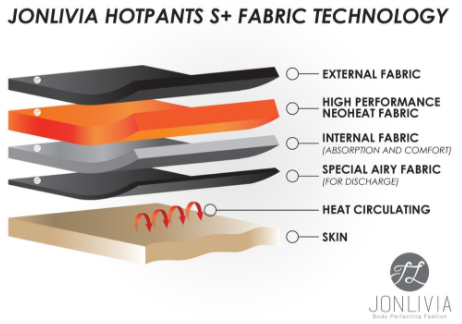 With their fabric technology comparison, it sounds more promising as technologically the Jonlivia Hotpants traps body heat that would also increase the blood circulation . A better blood circulation, works great for our overall health ! Apart from this ,if you are worried about the elasticity of their pants especially the hips area, Jonlivia Active Pants have strapped a double layer that prolongs the elastiscity so it will not burst nor loose the elasticity easily. I love the Jonlivia Hotpants double waist level which also looks great as a high waist pants that can be pulled up to the tummy level ! Not to forget, if you are going for a run or at the gym, you can place some emergency keys or cash in their hidden pocket pants which is at the back of the pants ! I must say I sweat way much more while exercising in their Jonlivia hotpants and I had felt my heart rate increases much faster than before. It sure feels like it takes less effort exercising to sweat while wearing the Jonlivia Hotpants. I realized that it was worth wearing this pants on daily basis or even as a fashion wear as it also keeps my skin hydrated and very smooth. My verdict, the trapped sweat underneath the pants could have worked as a natural moisturizer. it's made of of Neoprene which is a scuba diving material. However the inner stripped part containing a thin layer of spandax does work as a great airing material for this pants and making it quite stretchable. How effective in wearing the Jonlivia ActivPants ? Well, it all boils down to if you willing to wear this pants often or not. Somehow, I do feel like wearing this frequently does makes a difference as now I find myself being able to squeeze into my old skinny jeans easily. Not to forget, to be fit and loose weight does not just depend on Jonlivia Activ Pants ! You would surely need to put some effort in exercising and eat healthy too !! Cheers to a better and healthier New Year. I would totally recommend wearing Jonlivia while exercising to enhance the calorie burning rate and also not to forget to watch you diet. December is here and soon Jonlivia is having a 12/12 Promotion whereby you get exlcusive discounts plus a free tote bag from any RM200 purchase! From the 11th to the 13th of December, there will be 【12% + 12%】 off every products STOREWIDE! AND For every RM200 you spend,they'll even throw in a FREE Tote Bag! Click here to check out the ever awesome ActivPants PowerFlage http://bit.ly/2jK3qqL ! Stay fit, healthy and Beautiful!